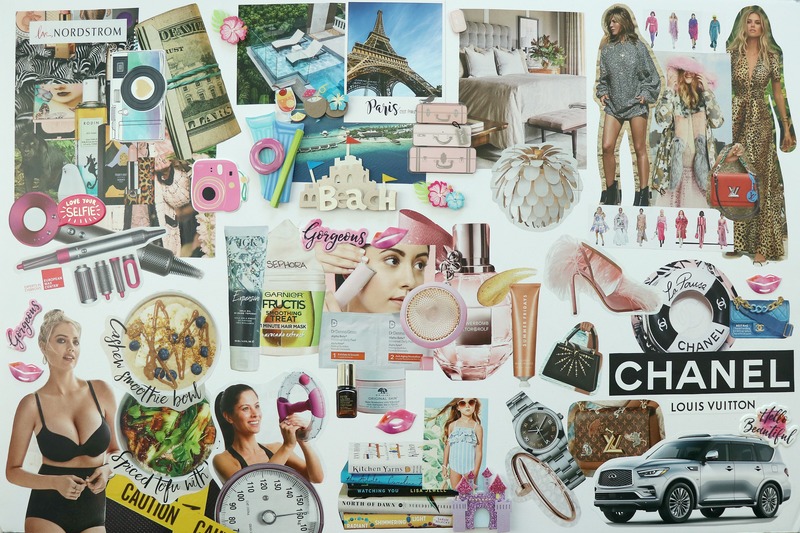 When I first heard about “vision boards”, I honestly didn’t understand them and thought they seemed kind of silly. Fast forward to a year after making my very first one, and I am chomping at the bit to get started on my new one for 2019. It gives you the chance to sit down and reflect on what you want in life. 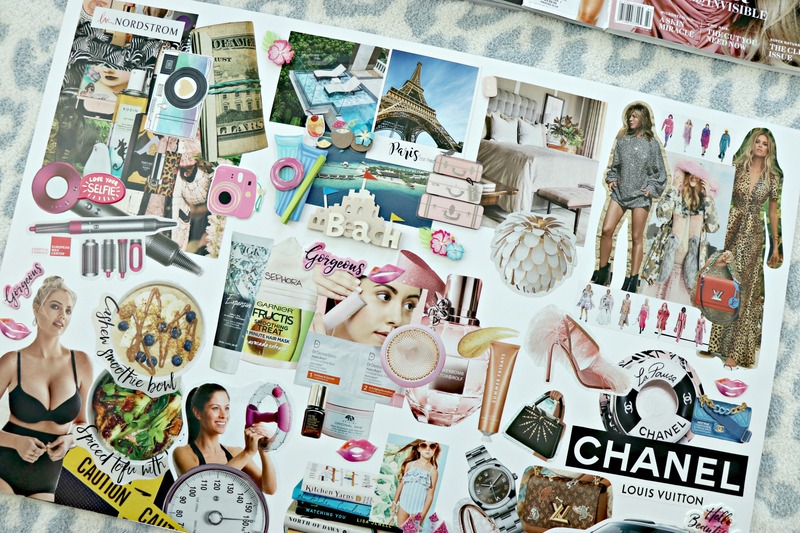 Everything from careers, to family goals, personal time, luxuries, financial goals, you can gather everything into one place and create a visual representation of it. I personally LOVE keeping mine in my office or bedroom so I can look over at it for inspiration and a great reminder of what I am working towards and how I am going to get there. 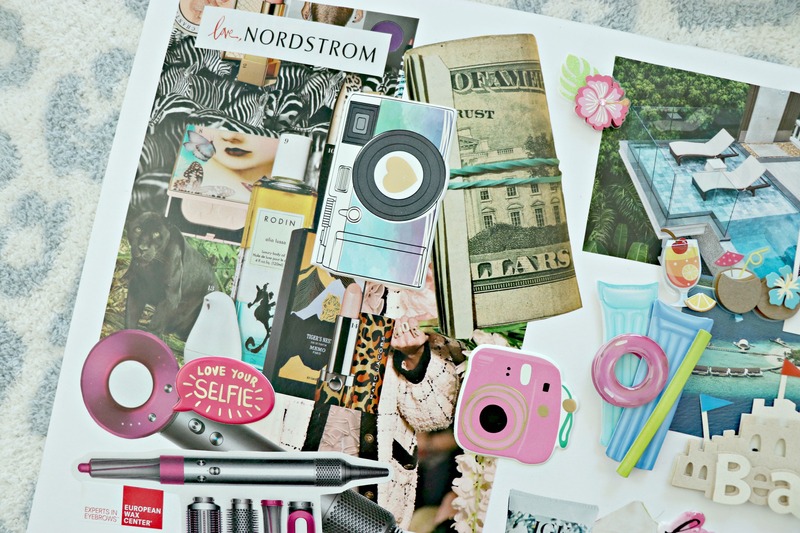 I accomplished most of what I put on my vision board last year and can’t tell you how much joy it brought me when I would accomplish something. What once was just a vision became reality one by one. I made my first one at the beginning of 2018 and although skeptical at first, I am now a firm believer in them. 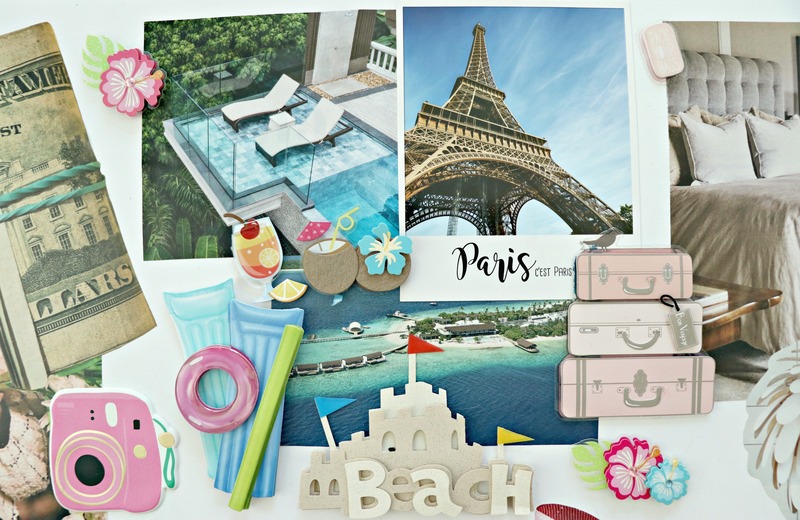 You can check out my post about my very first vision board HERE. Organization and categories make me super happy so it’s only fitting that I designed my board in this manner. I grouped everything by category. #BOSSBABE – this section is probably one of my biggest goals for the year – to make my social media passion into a full time career. Although I have taken leaps and bounds towards this goal during 2018, I want to continue to grow and be able to quit my day job so I can dedicate myself full time to my Blog and Instagram. Also, a Nordstrom logo because that is my NUMBER ONE dream collab for this year! TRAVEL – I LOVE to travel! I have had the fortune of traveling all around the world but there are still quite a few places left on my bucket list and places I would love to re-visit as well. Since I have been working so hard this past year, this momma needs a break and I am hoping to take a beach vacation within the next few months! FASHION – this is a two part goal. Number one is to be more fashionable myself. If you see me most days, I am wearing yoga pants and a t shirt, not the most chic. I would love to find and develop my personal style more. 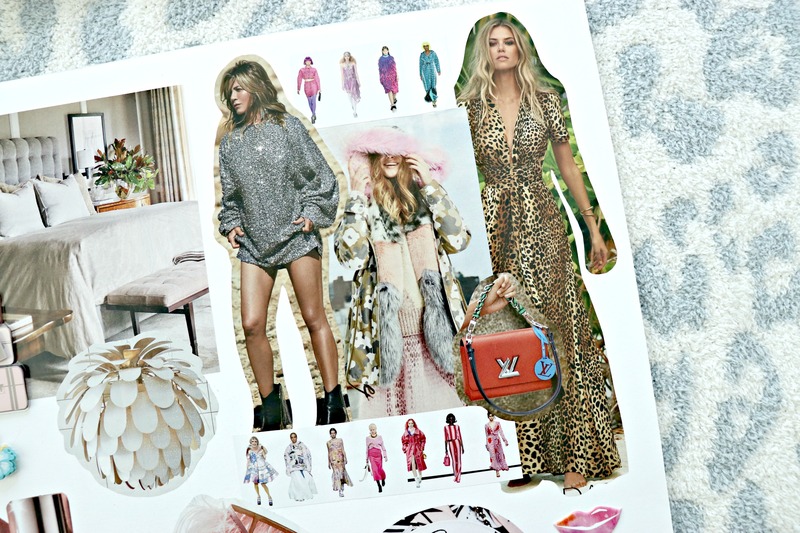 The second part of this is to be better about sharing great fashion finds on my social media. LUXURY – I have been working since I was 12 years old and no that’s not an exaggeration. I’ve always been very good with my personal finances and as most of you already know, I have an affinity for designer bags. The ones I currently own have all been gifts from my husband. My goal this year is to be able to not only be able to buy my own first Chanel bag, but to also be able to buy my husband a few luxury items he has been lusting after as well. 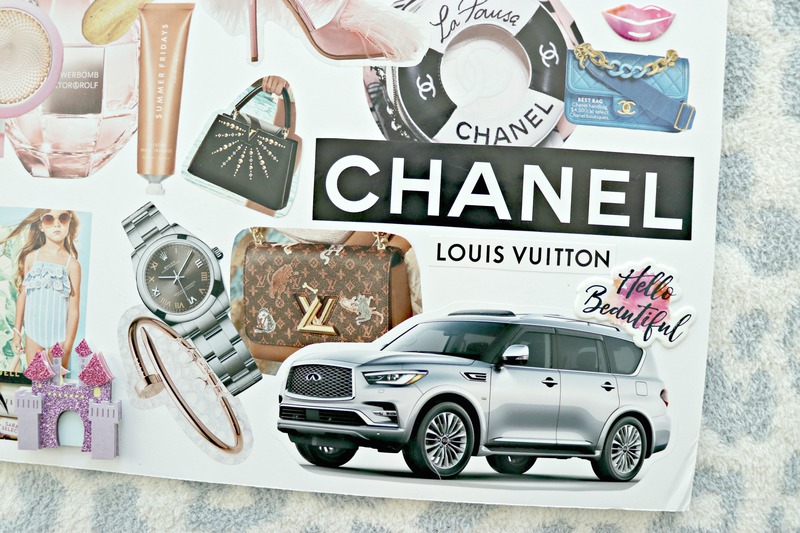 Also on my board is my dream car – the Infinity Qx80. I test drove it last year and totally fell in love! 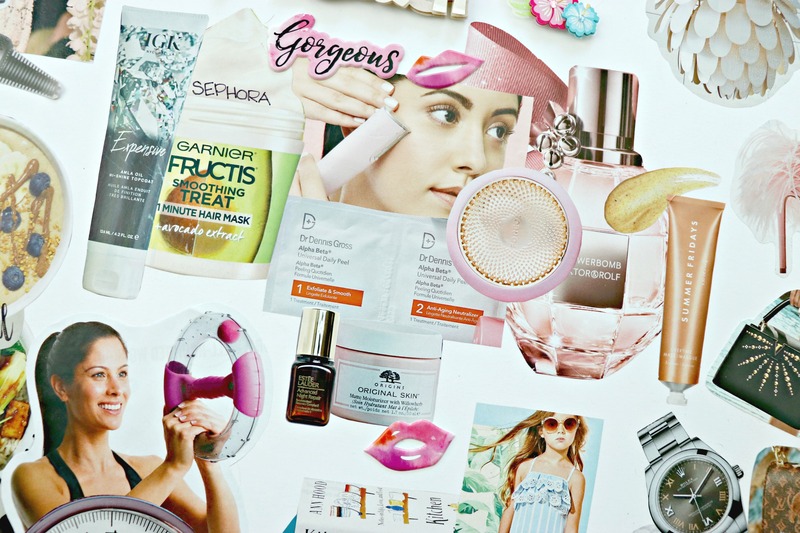 BEAUTY – this section features some brands I would love to be able to work with this year such as Sephora, Dyson, Foreo, Dr. Dennis Gross and Estee Lauder just to name a few. 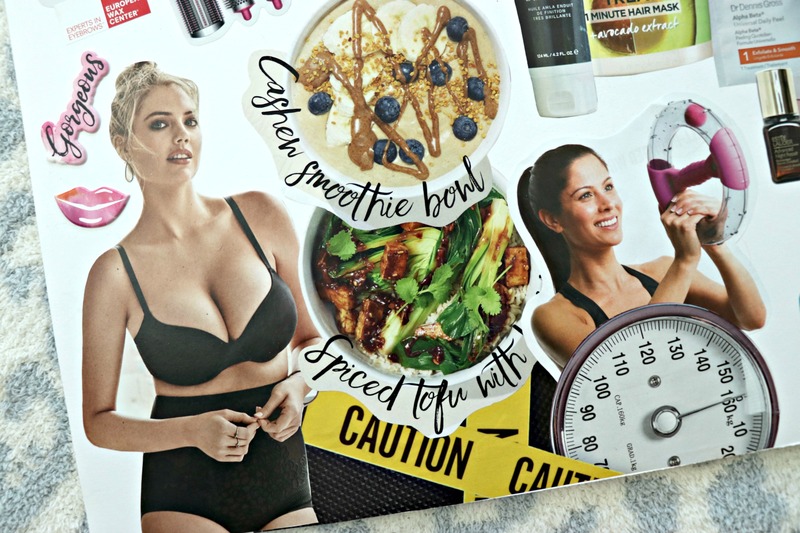 But it also features some of my favorite “Self Care” items – another goal for this year. I want to make more time for myself and for my family. 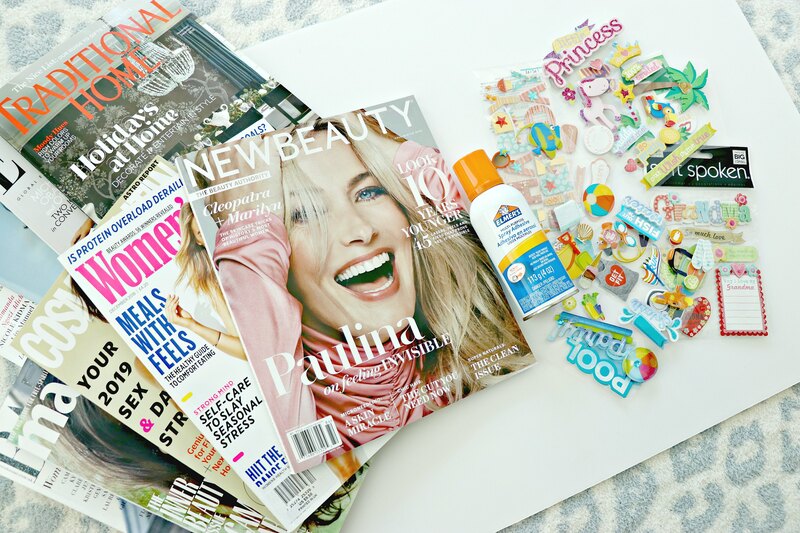 That’s also why there is an image of books – I want to make more time to read, and a photo of an adorable little girl, to represent my Mia – accompanied by a castle sticker chosen and placed by non other than the princess herself! HEALTH & FITNESS – this is a goal I am happy to say I started working on over a month ago. Not wanting to wait for the new year, I got a bit of a head start and dove right on in. I have began incorporating more exercise into my daily routine and want to continue to get in better shape and improve my overall health. I have also made huge improvements in my eating habit and want to continue to find a way of eating that’s both healthy and satisfying to this sweet toothed gal! I also want to stop focusing so much on the number on the scale, something I am SUPER guilty of! And also a big goal is to find new and fun exercises I actually enjoy and look forward to.